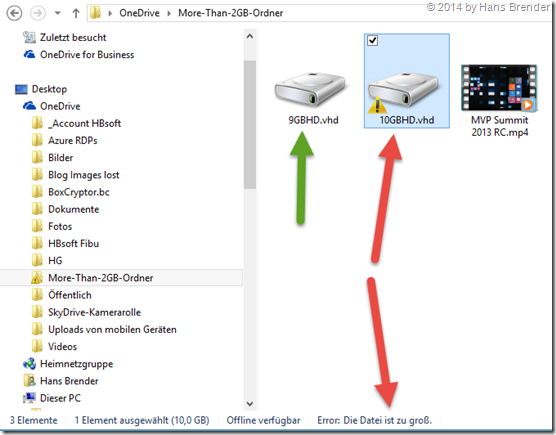 Startseite > Cloud, Office365, OneDrive, OneDrive for Business	> OneDrive | file length 2GB, 4 GB, 8 GB or unlimited? OneDrive | file length 2GB, 4 GB, 8 GB or unlimited? Sometime Microsoft announced new things about products weeks and month ahead. Since marketing plays a great role, to show the competitors, what will happen in the near future. So also with the consumer product OneDrive. Omar Shahin, Microsoft Manager announced on 23 June 2014 on the Microsoft OneDrive blog that the available memory is increased in the cloud. I have written about that here. Now, however, Microsoft holds back information. Because in the near future Microsoft will drop the 2 GB file size limitation in OneDrive. Also I have written about it here. And had the good fortune to experience this lifting this limit already. What is not clear, where are the new limits? while file sizes> = 10 GB with an error message at the start of the synchronization were displayed, I could synchronize a file with 9 GB in my OneDrive. This means that the new restriction is a single file with 10 GB. Now you do not have to try it with your files, because the official statement from Microsoft is still pending. Before you get started: If you have multiple devices in use and want synchronize files using OneDrive, you should look at your capacity of each device exactly. I have as a Surface RT (1st generation) and on this device I have little space on it. That’s why I created a folder for the large files, and this is set to "Only Available online". Since more than 250 million users work with OneDrive, these data are in various Microsoft data centers on different servers. And they must all be brought on the server side to the new state. This can already take a considerable time to complete. And that will be the reason why Microsoft has not made any statement about this change. And on the Internet, many users ask, what things look like with OneDrive for Business? Again, the consumer program OneDrive is one step ahead, but that will change in the near future, both Microsoft developer teams (OneDrive and OneDrive for Business) work together under common leadership. But about that I will write another blog post. Yep, kann ich bestätigen die 2GB Grenze ist Geschichte. Super! OneDrive for Business | Sicherheit in der Cloud – Vortrag OneDrive | Dateigröße 2 GB , 4 GB, 8 GB oder unbeschränkt?